Sam Kahamba Kutesa (centre), President of the sixty-ninth session of the General Assembly, opens the general debate of the session. He is flanked by Secretary-General Ban Ki-moon (left) and Tegegnework Gettu, Under-Secretary-General for General Assembly and Conference Management. For New Yorkers, the annual week of mid-town gridlock is well under way. Security details are seen posted on roof tops, at least half a dozen boats are patrolling the East River that borders the iconic UN complex – centre stage for world leaders from more than 140 countries from tomorrow until 1 October, for which some 2,000 media accreditations have been given. 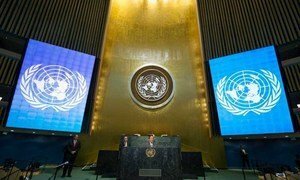 Starting tomorrow, the Assembly's annual high-level segment, known as the “General Debate”, will spotlight 196 speakers over a period of six days on major issues of international concern, comprising all the 193 UN Member States, as well as the Observer State of the Holy See, the Observer State of Palestine and the delegation of the European Union. Speakers will take the floor over the next week on the theme of the debate, “Delivering on and Implementing a Transformative Post-2015 Development Agenda” as well as urgent crises ranging from the ongoing conflicts in Syria, Iraq, Ukraine and South Sudan. Among the high-level meetings are a Security Council summit Wednesday chaired by United States President, Barrack Obama, whose country holds the body's presidency for the month, to draw international attention and action to the growing and dangerous phenomenon of foreign terrorist fighters; and a session convened by Secretary-General Ban Ki-moon for 25 September to focus on a more robust international response to Ebola crisis in West Africa. As has been the case over the past 68 General Assembly sessions, the journalists and diplomats will be focusing on the meetings and unplanned encounters on the “sidelines” of the General Debate. And this year's General Assembly will be back in its original chamber, which, after a massive, years-long renovation project has the look and feel of the original structure from the 1950s minus the threadbare carpet, old ashtrays, and the tar and nicotine built up over decades of smoking by the delegates, but with the one-and-a-half inches added to the desks to make them wheelchair accessible. The frenzied preparations for just a single State visit have been popularized by the television series The West Wing . Now multiply that frenetic energy by 196 ¬– the number of leaders expected to address the opening of this year’s United Nations General Assembly session – and you get an idea of the sheer amount of work being put into making sure everything goes off without a hitch.